A two-man toboggan team, The In-Laws, made up of Rick Pierson of Northport and Mark Castlellano of Rockland, take to the toboggan chute at the Camden Snow Bowl on Saturday, Feb. 11, 2012 for the 22nd annual U.S. National Toboggan Championships. CAMDEN, Maine — Participants from across the country converged on the Camden Snow Bowl Saturday and Sunday to determine the fastest toboggan teams in the United States. The approximately 1,000 participants were met with the lightest of falling snow Saturday and biting cold Sunday at the Camden Snow Bowl for the 22nd annual installment of the U.S. National Toboggan Championships. Mike Wagner and Mike Searle of Toledo, Ohio, were among six graduates of the Class of 1969 from Clay High School in Oregon, Ohio. The six have remained friends over the past 43 years. One of their friends vacationed in the Camden area and mentioned the Toboggan Championships to the others. 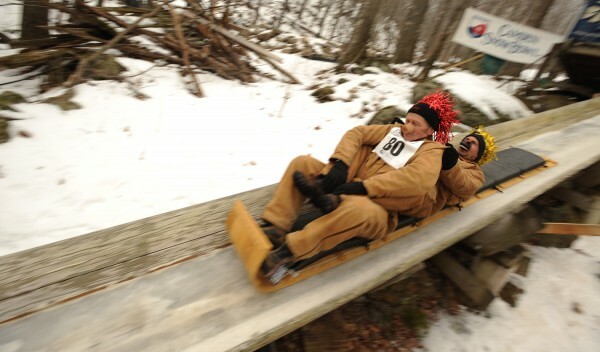 For Wagner and Searle, last year was their first taste of competing in the high-speed toboggan races. The two noted they are retired and now have time for such adventures. The two built their own toboggan this year and drove to Detroit, Mich., to purchase a custom 1½-inch foam cushion they attached to their toboggan to better protect their aging backsides, a lesson they said they learned from the 2011 races. The reason for coming to the races was obvious to Wagner. “We have more fun than human beings should be allowed to have,” Wagner said. Searle had another reason for enjoying the weekend. “By day, it’s about the toboggans, by evening it’s about putting a dent in the lobster population and the blueberry ale,” Searle said. The Clay Eagles, as they are called, finished the day with a time of 9.56 seconds for the 400-foot-long ice-covered toboggan chute. For Marge Funk, Yasemin Turkman and Jeanine May of New Haven, Conn., this was their first year at the toboggan races. The members of Team Pulse are from the Yale School of Nursing in New Haven. Three other staff members from the school are named Team Pulseless. The Pulse team also heard about the races from a friend who vacations in Maine. This was a repeat performance for a group of friends from southern Maine. They divided up their group into two teams — the Woo Hoo Warriors and the We Be Bads. Margaritt McNulty of Standish said the women became friends by running in road races together and they decided to do other activities as a group. “We had a waxing party before the Super Bowl last week,” McNulty said. This weekend, however, they took to the chute. One of the other members of the southern Maine group, Linda Davis of Casco, said her heart was beating fast as they approached the top of the chute in preparation for their first run. At the bottom, she said her heart was still pounding fast but she was having a great time. Charles O’Brien and Jim Desmond of Portland work at Gritty McDuff’s brewery in Portland and went by the fitting team name of Team Gritty. O’Brien said Team Gritty has been running the toboggan race since the second year of the event. O’Brien said that in the first year they raced, they had heard about the event from a friend and didn’t even have a toboggan. “We stopped at L.L. Bean on the way up and bought one,” O’Brien noted. This year, the two are riding aboard a custom-made toboggan. Camden Parks and Recreation Director Jeff Kuller said Sunday afternoon that the weekend was a great success thanks to the participants and many volunteers including members of the Coast Guard from Rockland. The four-person team Bull Hoss Fusilliers finished with the best times to take first place in the four-person category. The team finished with a combined time of 17.76 seconds for its two runs on Sunday. The team also had the best single run of 8.86 seconds. Not All There finished second in the four-person category with a combined time for the two runs of 17.77 seconds. Third was Bunch of Yahoos at 17.82 seconds. In the three-member category, Spudrunner 3 was first at 17.77 seconds. Absolute Zeros was second at 17.81. Cracker My Ash was was third in the category at 17.86. And in the two-person category, Two Wingnuts was first at 17.85 seconds. Throbbin Boggins was second at 17.89. Fat Bloated Idiots was third at 17.92 seconds. In the experimental category, Rum Rummers was first at 17.83 seconds. Big Nose Kate was second at 17.92 and Section 8 was third at 17.95. The fastest female team was Riverhouse at 8.96 seconds. The fastest kids team was the Returning Champions at 9.04 seonds. The fastest high school team was the Night of the Living Sled at 8.88 seconds. The fastest college team was Southern Comfort from Virginia Wesleyan College at 8.90 seconds. The oldest team, with an average age of 72, was the Reading Rockets with no time listed. The toboggans reach speeds of up to 40 miles per hour. The event raises $40,000 to $60,000 annually for the town-run Snow Bowl.